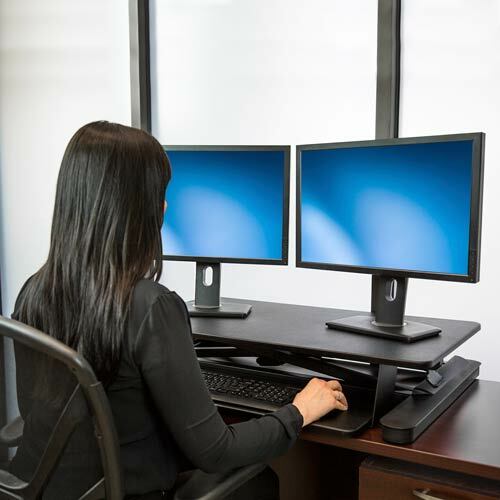 This sit-stand workstation transforms your current desk or tabletop into an ergonomic workspace, easily and cost-effectively. 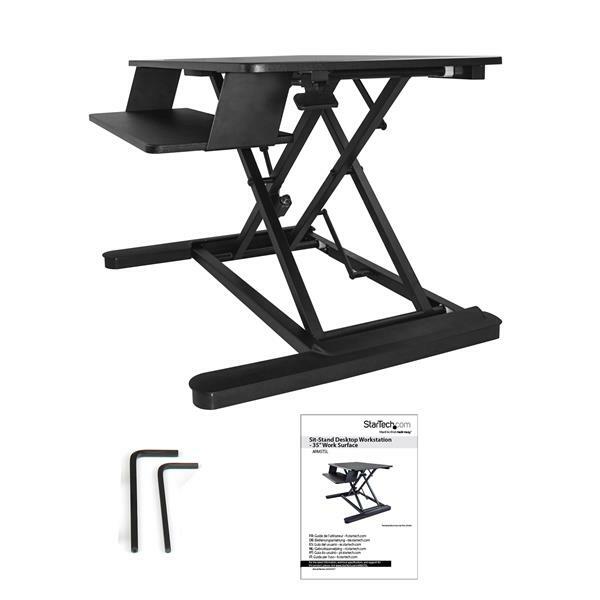 The height-adjustable standing desk converter sits on your desk to function just like a standing desk, providing a large work surface that holds two 24" monitors. Move it up or down with one smooth motion, to work in greater comfort and remain productive without disrupting your work while switching from a seated to standing position. 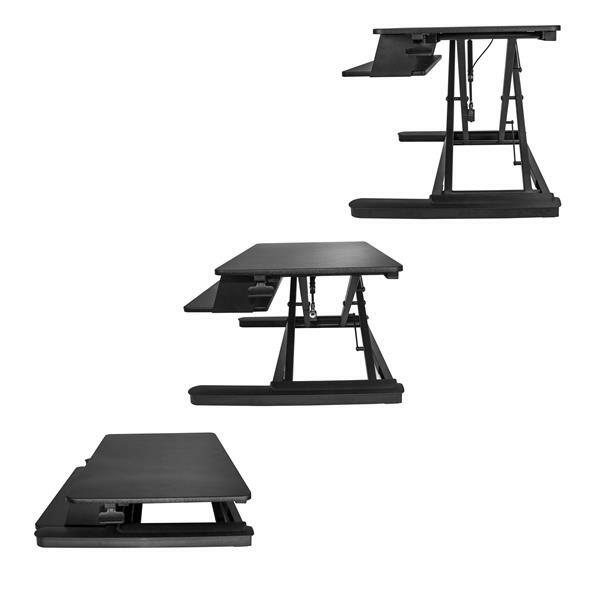 The sit-stand desk converter comes fully assembled, so you can be up and running quickly. Moving between sitting and standing throughout your work day brings many health benefits, from increased circulation to reduced fatigue. 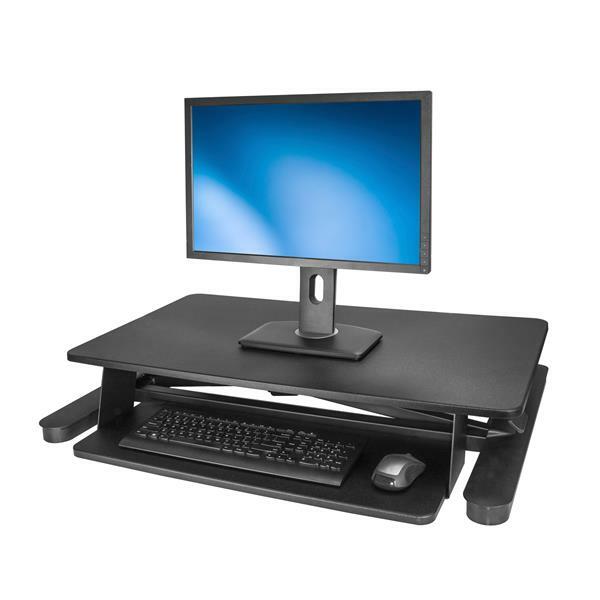 The sit-stand workstation makes it easy to change your position throughout the day. Change the height of your work surface, effortlessly, with a height adjustment range of 15.7" (399 mm). You simply squeeze the lever at the side, and then move the workstation up or down smoothly, using pneumatic technology. 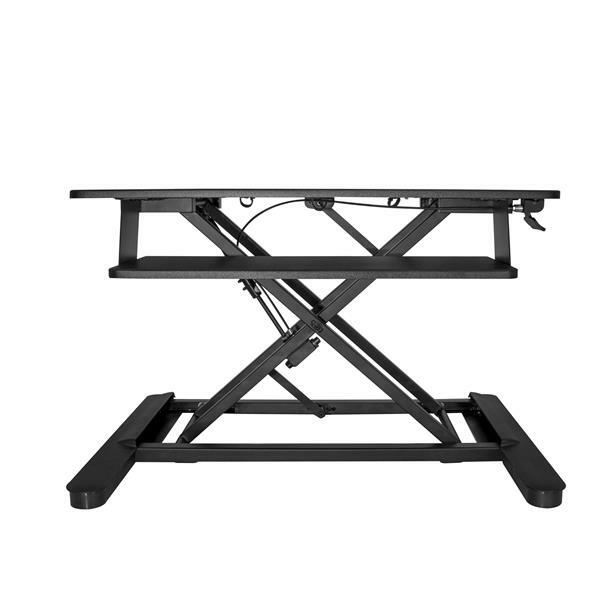 Its straight up-and-down movement saves space and provides a stable platform as it moves, with no fear of tipping. Plus, there are no preset levels, so you can find the precise height you need to work most comfortably. 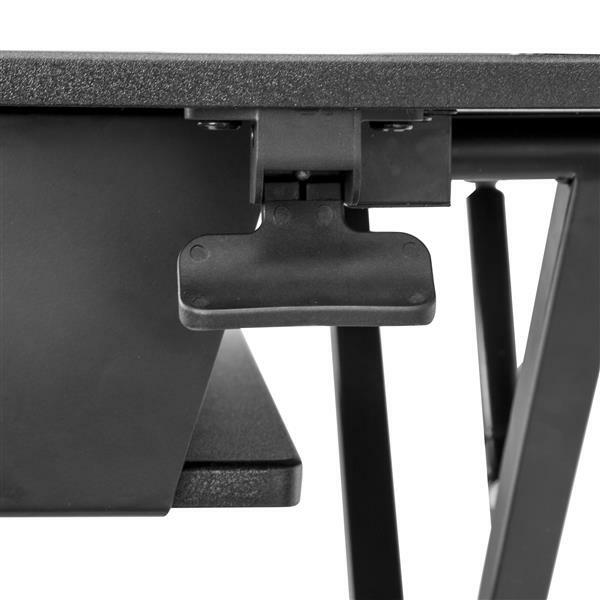 It also offers a counterbalance feature, so you can adjust the tension according to the weight of your monitors, to raise or lower the work surface with ease. The sit-stand workstation is conveniently sized for easy integration into your workspace. It’s large enough (35.4” wide) to hold two 24” monitors, yet small enough to fit on most desks or other surfaces. 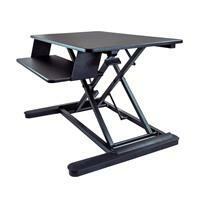 Whether you work in an office setting, cubicle, or home office, the sit-stand workstation sits easily on your desk or work surface, and even works well for corner desks. It works well on a variety of surfaces that are 24” or deeper. The work surface supports a weight capacity of 28.1 lb. (12.7 kg). The desktop workstation also features a large keyboard tray, with plenty of room for personal items like your phone. 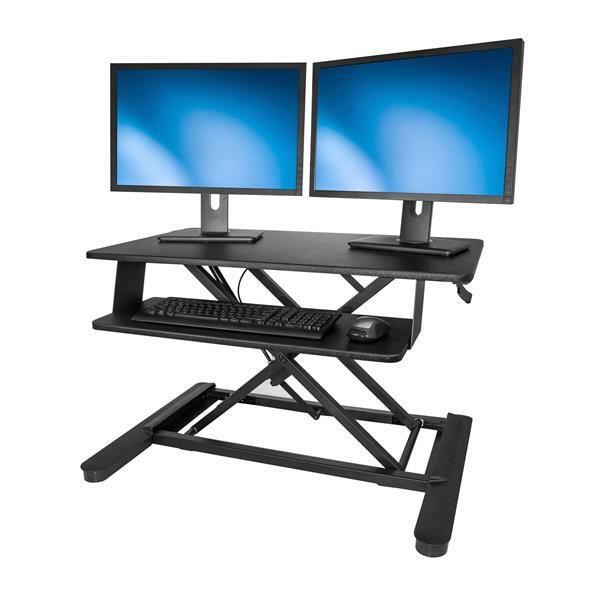 The sit-stand desktop workstation comes fully assembled so you’ll be up and running quickly. It also includes cable management to keep your cables organized and out of sight. The ARMSTSL is backed by a StarTech.com 2-year warranty and free lifetime technical support. Note The keyboard tray (26.8” x 10.4”) has a weight capacity of 2.3 lb. (5 kg). This sit and stand come ready to go out of the box. Fit nicely on my desk. It rises and collapses with little effort. I have used this desk lift for many weeks and have not had any problems with it. The lift came in a very large and heavy box. The delivery driver had a hard time bringing it to my front door. The box could have easily fit an unassembled coffee table or chair in it. The lift moves very easily with two hands up and down. It has a lot of weight to it so it doesn't come off the desk when you lift it all the way up. You can position the height of the desk at any interval and releasing the handle locks it into position. Whatever height I set the lift to, I can still lean my body weight on it and it will not budge. The rubber feet keep it from moving around the top of the desk while I lean on it. The lift comes with a torque wrench to adjust the pressure needed to move it up and down. I found that I did not need to adjust it after I put my monitor and wireless keyboard and mouse on it. Without any weight on the lift I had to lean on it while holding the handle to move it down (no issues once things were on it). The keyboard tray can be adjusted about 1.5" outward, which was helpful as the top of the keyboard is not visible when the tray is back all the way. My only complaint with the lift is the keyboard tray could be more adjustable. You can only have it in two positions (in or out) by moving 12 screws. And why does it have 12 screws when only 2 or 4 could have been used as it sits on a ledge? This sit-stand desk left is awesome, well built and very solid. It could have a more flexible keyboard tray, but this doesn't matter because it is so well built. I received this product in exchange for an unbiased review. You couldn't ask for more with this sit-stand desk addition. 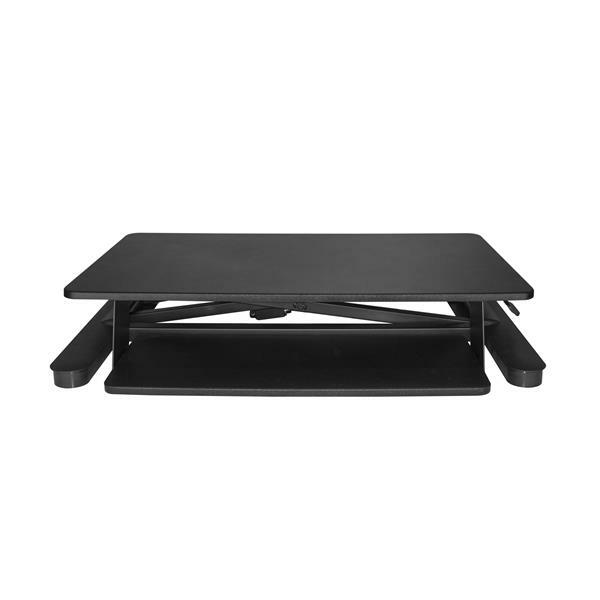 It is quality built with a non-slip surface both on the top and on the feet that grip to the desk so there is no worries about things falling off the stand or the stand falling off the desk. The locking mechanism is solid and easy to use and moving the stand up and down is incredibly light-weight and easy. I was able to put my two monitors on this stand and still have room for paperwork. If I had one con, it would be that the keyboard tray could be a little deeper to support my wrists while typing. However, definitely don't let that be a blocker as I was able to get used to it within a few days.